Yard Signs are mounted on sturdy 6 mm white Coroplast (Corrugated Plastic) material. These are similar to corrugated cardboard but have plastic finish. Our Yard Signs are mounted on sturdy 6 mm White Coroplast (corrugated plastic) material, which is similar to corrugated cardboard but has plastic finish. They are delivered with heavy duty step stakes ready to be used. Custom yard signs can be one of the best promotional bargains. These attention grabbing yard signs are perfect for political candidates, realty offices, future events, and other advertising needs. Print yard signs are constructed of hardy six millimeter corrugated plastic and contain print on just one side. These print yard signs come already prepared with strong stakes to make installation easy. In fact, putting up these light plastic signs is a one person job. Plastic yard signs have several advantages over other types of advertising. 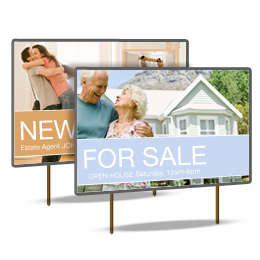 Customers find print yard signs extremely versatile because they can be easily moved from site to site. Custom yard signs are also unique because customers get to choose the designs, colors, and fonts used on these plastic yard signs. Custom yard signs are also durable and can sometimes be stored and reused when needed again. Print yard signs can usually be ready for use within a week to ten days and are quite economical compared to other promotional methods. Custom yard signs can be designed and ordered online, and the directions for doing so are simple and clear. Once these plastic yard signs are ready, they will be packed and shipped in sturdy cartons.